To get admission in Army Medical College (AMC) and other affiliated colleges through NUMS is very challenging due to less number of seats available. Every year thousands of students appears in NUMS test only few secure admission in AMC and other affiliated colleges of NUMS. Entrance test for NUMS/ AMC is very technical and competitive and only those students can get good marks in NUMS (AMC) entrance test who have good conceptual knowledge of entry test subjects. National University of Medical Sciences (NUMS) entry test is based on MCQ’s type questions conducted by NTS. NUMS test include Physics, Chemistry, English and Biology MCQ’s. Due to less number of seats competation is high, we recommend students to prepare from www.pakprep.com for NUMS entry test. 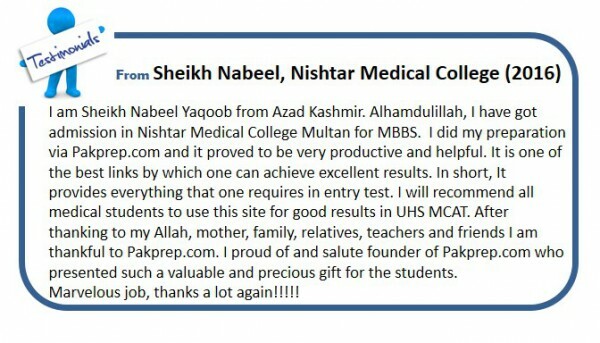 www.pakprep.com provides more than 15000+ fully explained MCQ’s with answers and solution. For your preparation click here. Here are some MCQ’s of Physics with answers and solution. This entry was posted in NUMS and tagged AMC, AMC 2017, AMC Admission Form, AMC Admission Test, AMC Admission test 2016, AMC Biology MCQs, AMC Biology MCQs with answer, AMC Biology MCQs with answers, AMC Biology MCQs with explanation, AMC Biology MCQs with solution, AMC Chemistry MCQs, AMC Chemistry MCQs with answer, AMC Chemistry MCQs with answers, AMC Chemistry MCQs with explanation, AMC Chemistry MCQs with solution, AMC Entry Test, AMC MBBS, AMC MCQs, AMC MCQs with answer, AMC MCQs with answers, AMC MCQs with explanation, AMC MCQs with solution, AMC Merit list, AMC Merit list 2016, AMC Past Papers, AMC Physics MCQs, AMC Physics MCQs with answer, AMC registration, AMC registration 2017, AMC registrations, AMC registrations 2017., amc test result, How to prepare for AMC admission test, How to prepare for NUMS admission test, mbbs, MBBS 2016, MBBS 2017, MBBS admission, MBBS admission 2016, MBBS admission 2017, MBBS Admission Test 2016, MBBS Admission Test 2017, MBBS in Pakistan, mbbs merit list, MBBS Merit list 2016, NTS NUMS, NTS NUMS Admission, NUMS, NUMS Admission, NUMS admission 2017, NUMS Admission form, NUMS Admission test, NUMS admission test 2016, NUMS admission test 2017, NUMS admissions 2017, NUMS Answer Key, NUMS BDS, NUMS BDS Admission, NUMS BDS Admission 2017, NUMS BDS Admissions, NUMS BDS Admissions 2017, NUMS Biology MCQs, NUMS Biology MCQs with answer, NUMS Biology MCQs with answers, NUMS Biology MCQs with explanation, NUMS Biology MCQs with solution, NUMS Chemistry MCQs, NUMS Chemistry MCQs with answer, NUMS Chemistry MCQs with answers, NUMS Chemistry MCQs with explanation, NUMS Chemistry MCQs with solution, NUMS English MCQ's, NUMS English MCQ's with answer, NUMS English MCQ's with answers, NUMS English MCQ's with explanation, NUMS English MCQ's with solution, NUMS Entry Test, nums entry test preparation, NUMS MBBS, NUMS MBBS Admission, NUMS MBBS Admission 2017, NUMS MBBS Admissions, NUMS MBBS Admissions 2017, NUMS MBBS Merit list, NUMS MBBS Merit list 2016, NUMS MCQS, NUMS MOCK test, NUMS Pastpapers, NUMS Physics MCQs, NUMS Physics MCQs with answer, NUMS Physics MCQs with answers, NUMS Physics MCQs with explanation, NUMS Physics MCQs with solution, NUMS Registration, NUMS Registration 2017, NUMS registration date, NUMS registration date 2017, NUMS registration dates 2017, NUMS Result, NUMS solved papers, NUMS test format, nums test result, Physics MCQs with answers, Physics MCQs with explanation, Physics MCQs with solution on July 31, 2017 by Pakprep.com Admin. NED is one of the oldest engineering university of Pakistan established in 1922. NED is also stands among top engineering universities of Pakistan. Last date of apply for NED admission in 11th August and admission test will held on 19th August 2017. Minimum 60% marks are required for top engineering programs. Students with result awaiting can also apply for NED admission. NED test will be consist of MCQ’s type test with Physics, Chemistry, Maths and English subjects. Pakprep.com provide complete material for NED test preparation. We have more than 15,000+ fully explained MCQ’s with solution. To start your preparation Click here. This entry was posted in Entry Test Preparation, NED and tagged Best way to prepare for NED, ned, NED Admission, NED Admission 2017, NED Admissions, NED Admissions 2017, NED Chemistry, NED Chemistry MCQ's, NED Chemistry MCQ's with answers, NED Chemistry MCQ's with explanation, NED Chemistry MCQ's with solution, NED English, NED English MCQ's, NED English MCQ's with answers, NED English MCQ's with explanation, NED English MCQ's with solution, NED Entrance Test, NED Entry Test, NED entry test 2015, NED Entry Test MCQs, NED karachi, NED Maths, NED Maths MCQ's with answers, NED Maths MCQ's with explanation, NED Maths MCQ's with solution, NED Maths MCQs, NED MCQs, NED merit, NED Merit list, NED Past Papers, NED Physics, NED Physics MCQ's with answers, NED Physics MCQ's with explanation, NED Physics MCQ's with solution, NED Physics MCQs, NED programs, NED solved MCQ's, NED Syllabus, NED test, NED test 2017, NED test pattern, NED test pattern 2017, NED undergraduate, NED Undergraduate Admission on July 28, 2017 by Pakprep.com Admin. ETEA medical has announced result for the test held on 23rd July 2017. Laiba Ahmed with 668 marks toped the ETEA medical test 2017. To check your result with roll number and Name click here. Here is the list of top ten students of KPK ETEA Medical test 2017. www.pakprep.com provides complete preparation material for the ETEA Medical test. We have more than 15000+ MCQ’s with solution which helps students in getting good marks. To start your preparation Click here. This entry was posted in KPK ETEA Medical and tagged Ayub Medical College ETEA, Best way to prepare for ETEA, ETEA, ETEA 2017, ETEA Admission, ETEA Admission 2017, ETEA BDS Admission 2017, ETEA BDS Admissions 2017, ETEA Biology MCQs, ETEA Biology MCQs with answers, ETEA Biology MCQs with explanation, ETEA Chemistry MCQs, ETEA Chemistry MCQs with answer, ETEA Chemistry MCQs with answers, ETEA Chemistry MCQs with explanation, ETEA KMU, ETEA KPK Past Paper, ETEA MBBS, ETEA MBBS Admission, ETEA MBBS Admission 2017, ETEA Medical, ETEA Medical 2017, ETEA Medical Merit, ETEA medical Merit List, ETEA medical Merit List 2017, ETEA Medical Result, ETEA Medical Result 2017, etea merit, ETEA Merit List, ETEA merit list 2017, ETEA Preparation Online 2015, ETEA Preparation Online 2017, ETEA result, ETEA Result 2017, ETEA test, ETEA test result, ETEA Test result 2017, kmu, KMU 2017, KMU Admission, KMU Admissions, KMU Entrance Test, KMU Entrance Test Online Preparation, KMU test result, KMU test result 2017, KPK ETEA, KPK ETEA Medical on July 26, 2017 by Pakprep.com Admin. Last chance to apply for MDCAT test announced by University of Health Sciences (UHS) for 2017-18 session. Last date to apply for the registration of MDCAT test is 28th July 2017. Students willing to get admission in Public sector medical colleges of Punjab must register them before last date to avoid inconvenience. MDCAT test for MBBS and BDS will held on 20th August 2017. Students will to appear in MDCAT/MCAT test have to prepare Biology, Physics, Chemistry and English MCQ’s. MDCAT test is very conceptual so students need to clear concepts in detail. Pakprep.com provide good quality MCQs according to MDCAT/MCAT new syllabus announced by UHS in 2017. We have more than 15000+ MCQ’s with solution which help students to get good marks in MDCAT/MCAT test. To start your preparation for MDCAT Click here. This entry was posted in MDCAT, Punjab UHS MCAT, UHS MCAT and tagged Best way to prepare for UHS MCAT, Changes in UHS MCAT Syllabus, chemistry mcat, chemistry mdcat, download UHS MDCAT Papers, Download UHS Past Papers, How to Prepare for Punjab MCAT, How to Prepare for Punjab MDCAT, how to prepare mcat, how to prepare mdcat, Important Biology Topics Punjab MCAT, Important Biology Topics Punjab MDCAT, Important Chemistry Topics Punjab MCAT, Important Chemistry Topics Punjab MDCAT, Important English Topics Punjab MDCAT, important mdcat topics, Important Physics Topics Punjab MDCAT, MCAT English syllabus, MCAT English syllabus 2017, MCAT entry test, mcat format, MDCAT, MDCAT 2017, MDCAT Biology, MDCAT Biology explained MCQs, MDCAT Biology MCQs, MDCAT Chemistry, MDCAT Chemistry explained MCQs, MDCAT Chemistry MCQs, MDCAT English explained MCQs, MDCAT English MCQs, MDCAT English syllabus, MDCAT entry test, MDCAT explained MCQs, mdcat format, mdcat mcqs, MDCAT Merit list, MDCAT New Syllabus, MDCAT online MCQS, MDCAT Physics, MDCAT Physics explained MCQs, MDCAT PhysicsMCQs, MDCAT registration, MDCAT registration date, MDCAT registration date 2017, MDCAT registration dates, mdcat result, mdcat score, MDCAT solved papers, New Physics Syllabus for UHS MCAT, New UHS MCAT Syllabus, Past Papers UHS MDCAT, punjab mcat, Punjab MCAT 2017 Syllabus, Punjab MCAT Solved Papers, Punjab MDCAT Biology MCQs, Punjab MDCAT Chemistry MCQs, Punjab MDCAT English MCQs, Punjab UHS Medical Test, UHS MCAT, UHS MCAT Dates, UHS mcat merit list, UHS MCAT Online MCQs, UHS MCAT Past Papers, UHS MDCAT, UHS MDCAT 2017, UHS MDCAT Dates, UHS MDCAT English MCQs, UHS MDCAT Entrance Test, UHS Medical Admission, UHS registration, UHS Scholarships, UHS Solved Papers, UHS Test format, UHS test result on July 26, 2017 by Pakprep.com Admin. This entry was posted in NUST and tagged How to Calculate NUST Aggregate, nust admission, nust Aggregate 2017, NUST Aggregate Calculator, nust merit list, NUST NET 2018, NUST NET MCQs, NUST NET Preparation Online on July 22, 2017 by Pakprep.com Admin. University of Engineering and Technology has announced it answer keys for ECAT test held on 16TH July 2017. There are different combinations in UET Green booklet. Chemistry, Computer and Statistics are the three combinations. Pakprep.com provides complete material for the preparation of UET ECAT test with more than 15,000+ solved MCQ’s along with explanation which help students to get desired result in ECAT test. To start your preparation Click here. Here are the answer keys for Green Booklet containing all three combinations (Chemistry, Computer and Statistics). This entry was posted in UET and tagged Best way to prepare for UET, Download ECAT Past Papers, ECAT, ECAT 2017, ECAT Answer Key, ECAT Answer Key 2017, ECAT Answer Keys, ECAT Answer Keys 2017, ECAT Chemistry Explained MCQs, ECAT Chemistry MCQs, ECAT Chemistry MCQs with Answer, ECAT Chemistry MCQs with answers, ECAT Entry Test, ECAT Entry Test Answer Key, ECAT Entry Test Answer Key 2017, ECAT Entry Test Answer Keys, ECAT Entry Test Answer Keys2017, ECAT Entry Test Preparation Online, ECAT Punjab, Engineering Programs at UET, Green Booklet, Green Booklet Answer key, Green Booklet Answer key 2017, Green Booklet Answer keys, Green Booklet Answer keys 2017, greenbooklet, How to Prepare for UET Lahore, Merit List UET, UET, UET Admission 2017, UET Answer Key, UET Answer Key 2017, UET Answer Keys, UET Answer Keys 2017, UET Chemistry Explained MCQs, UET Chemistry MCQs, UET Chemistry MCQs with Answer, UET Chemistry MCQs with answers, UET ECAT Result, UET Entrance Test, UET Entrance Test Result, UET Entrance Test Result 2017, UET Entrance Test Results, UET Entrance Test Results 2017, UET entry test, UET Entry Test 2017, UET Entry Test Online Preparation, UET Explained MCQs Online, UET Faisalabad, UET Gujranwala, UET Lahore Admission, UET Lahore Admission 2017, UET Lahore Chemistry MCQs, UET Lahore Entrance Test, UET Lahore Entrance Test Result, UET Lahore Entrance Test Result 2017, UET Lahore Entrance Test Results, UET Lahore Entrance Test Results 2017, uet lahore mcqs, UET Lahore Merit List, UET Lahore Merit List 2015, UET Lahore Merit List 2016, UET Lahore Merit List 2017, UET Lahore Physics MCQs, UET Lahore Physics MCQs with Answer, UET Lahore Physics MCQs with Answers, UET Lahore Programs, UET Lahore Undergraduate Programs, UET Maths Explained MCQs, UET Maths MCQs with answer, UET Peshawar Scholarships, UET Physics MCQs with Answers, UET Taxila, uet taxila Explained mcqs, uet taxila mcqs with answer, uet taxila mcqs with answers, UET Test Answer Key, UET Test Answer Key 2017, UET Test Answer Keys, UET Test Answer Keys 2017 on July 17, 2017 by Pakprep.com Admin. ISSB test is the entry point to join Army, PAF or Navy in Pakistan as an officer. ISSB conducts tests to select future officers for three branches of armed forces of Pakistan. Career in Pakistan Armed Forces, Army, Navy and PAF are very sought after and competition is tough. ISSB test is held in Gujranwala, Malir and Quetta. Best way to prepare online for ISSB test is through Pakprep.com. It has verbal and non verbal intelligence tests and English coursework for initial test of ISSB. Register today to prepare online for your ISSB test. This entry was posted in ISSB and tagged How to join Paf after MBBS, How to prepare for ISSB, ISSB 2017, ISSB format, ISSB Intelligence Test, ISSB MCQs, ISSB Non verbal Intelligence test, ISSB online test, ISSB online test preparation, ISSB past papers, ISSB Preparation Online, ISSB Questions online, ISSB Screen out Test, ISSB Solved MCQs, ISSB Verbal Intelligence Test, Join Paf, Join Pakistan Army, Join Pakistan Navy, PAF initial test, Screen out test in ISSB, What is ISSB, Where is ISSB held on July 15, 2017 by Pakprep.com Admin. University of Health Sciences (UHS) has announced registration dates for MDCAT/MCAT test for 2017-18 session. Registration has been started and last date to apply for MDCAT/MCAT is 28th July 2017. Test for MBBS & BDS will help on 20th August 2017. No application will be entertained after last date. MDCAT/MCAT test will consist of Physics, Chemistry, Biology and English MCQ’s. There are almost 3400 seats available in 20 Public sector medical colleges of Punjab. Every year more than 55,000+ students appear in MDCAT/MCAT test so it brings high level of competition between students. Only those can secure seats in Public sector Medical colleges of Punjab who prepare well with depth concepts. Pakprep.com offer vast range of MCQs according to MDCAT/MCAT new syllabus announced by UHS in 2017. www.pakprep.com have more than 15000+ fully explained MCQS with complete explanation which help students to get good marks in MDCAT/MCAT test. To start your preparation for MDCAT Click here. This entry was posted in MDCAT, Punjab UHS MCAT, UHS MCAT and tagged Balochistan MCAT MCQs, Best way to prepare for UHS MCAT, Changes in UHS MCAT Syllabus, chemistry mcat, chemistry mdcat, download UHS MCAT Papers, download UHS MDCAT Papers, How to Prepare for Punjab MCAT, How to Prepare for Punjab MDCAT, How to Prepare for UHS MCAT?, how to prepare mcat, how to prepare mdcat, How to prepare Punjab Mcat UHS, Important Biology Topics Punjab MDCAT, Important Chemistry Topics Punjab MDCAT, Important English Topics Punjab MDCAT, important mdcat topics, Important Physics Topics Punjab MDCAT, MCAT New Syllabus, mcat result, MCAT Syllabus, MCAT test, MDCAT, MDCAT 2017, MDCAT Biology, MDCAT Biology explained MCQs, MDCAT Biology MCQs, MDCAT Chemistry, MDCAT Chemistry explained MCQs, MDCAT Chemistry MCQs, MDCAT English explained MCQs, MDCAT English MCQs, MDCAT English syllabus, MDCAT entry test, MDCAT explained MCQs, mdcat format, mdcat mcqs, MDCAT Merit list, MDCAT New Syllabus, MDCAT online MCQS, MDCAT Physics, MDCAT Physics explained MCQs, MDCAT PhysicsMCQs, MDCAT registration, MDCAT registration date, MDCAT registration date 2017, MDCAT registration dates, mdcat result, mdcat score, MDCAT solved MCQs, MDCAT solved papers, MDCAT syllabus, MDCAT syllabus 2017, New UHS MCAT Syllabus, Past Papers UHS MCAT, Preparation of Document for UHS MCAT, punjab mcat, Punjab MCAT 2015, Punjab MCAT 2015 Online Preparation, Punjab MCAT 2016, Punjab MCAT 2017 Syllabus, Punjab MCAT Biology MCQs, Punjab MCAT Chemistry MCQs, Punjab MCAT English MCQs, Punjab Mcat format, punjab mcat merit list, Punjab MCAT New Syllabus, Punjab Mcat result, Punjab MCAT Scholarships, PUNJAB MCAT Score, Punjab MCAT Syllabus 2017, Punjab MDCAT Biology MCQs, Punjab MDCAT Chemistry MCQs, Punjab MDCAT English MCQs, Punjab MDCAT Physics MCQs, Punjab UHS MCAT, punjabmcat, Sample UHS MCAT MCQs, UHS Admission, UHS Admissions, UHS Biology MCQs, UHS Chemistry MCQs, UHS Chemistry New Syllabus, UHS Chemistry Syllabus, UHS English Syllabus, UHS English Syllabus 2017, UHS Entry Test, UHS Fee, UHS MCAT, UHS MCAT 2013, UHS MCAT 2014, UHS MCAT 2015, UHS MCAT 2016, UHS MCAT 2017, UHS MCAT Biology MCQs, UHS MCAT Chemistry MCQs, UHS MCAT Dates, UHS MCAT Documents, UHS MCAT English MCQs, UHS MCAT Entrance Test, UHS MCAT MCQs, UHS mcat merit list, UHS MCAT Online MCQs, UHS MCAT Online Preparation, UHS MCAT Preparation, UHS MCAT syllabus 2017, UHS MCQs, UHS MDCAT, UHS MDCAT 2017, UHS MDCAT Aggregate Score, UHS MDCAT Biology MCQs, UHS MDCAT Dates, UHS MDCAT English MCQs, UHS MDCAT Entrance Test, UHS Medical Entry Test, uhs merit list, UHS Merit list 2016, UHS Past Papers, UHS Punjab MCAT Syllabus, UHS Punjab MCAT Syllabus 2017, UHS result, UHS result 2016, UHS Scholarships, UHS Test format on July 15, 2017 by Pakprep.com Admin.